“Unstoppable,” the Movie or Cancer? This past Friday night David and I went to the recently released movie, Unstoppable, starring Denzel Washington and Chris Pine. Going to movies is a passion we share, so we go as often as we are able. Both of us have found movie going to be even more enjoyable since my cancer diagnosis. It is an excellent way to escape for two hours or so and get caught up in someone else’s story. Plus, it’s dark in a movie theater which is nice when your physical attributes are not at their best. One can just blend in with the crowd and the darkness. The one time our escape effort was a dismal failure, at least for me, was when we went to a movie days before my bilateral last summer. That particular day even Robin Hood could not capture my attention for more than a few minutes at a time! Unstoppable is a story inspired by true events occurring in 2001 when a train accidentally “got away” due to human error and continued barreling down the tracks unmanned toward Stanton, Pennsylvania. It was pulling a full load of cars including several filled with hazardous materials. It picked up speed as it went along, becoming an unstoppable “missile.” Heroic measures finally prevented an unimaginable tragedy from taking place had it derailed in a highly populated area such as Stanton. The two unlikely heroes on board and manning a different train, played by Denzel and Chris, started off as rivals but ended up becoming close friends as they decided to take matters into their own hands by coming up with a plan to stop, or at least slow down, the runaway train. I won’t give away any more of the plot. While the two men were bonding during one of their intense scenes on board their train, Denzel revealed to his companion his wife had passed away four years earlier from cancer. Sitting in the theater hearing that simple emotionally charged statement, made me realize I could not totally escape from cancer even at the movies. I glanced over in David’s direction and immediately knew he was sitting there thinking the exact same thing. It was just a movie, but still the impact of that one line was powerful and its effect on us caught us somewhat by surprise. And why does it always seem to be the wife who passes away? Sometimes life does indeed seem like a “train wreck” or a disaster waiting to happen. Just like in the movie, sometimes we come face to face with challenges requiring decisions we never wanted to make. Sometimes we have to “dig deep” to find strength to just get out of bed and on with the day at hand. Sometimes it feels like the bad days are unstoppable. That’s when you need a hero or two of your own, even if it’s only you, because YOU are unstoppable, not cancer! You might think we didn’t enjoy this movie after it conjured up all this other “stuff,” but we did. It wasn’t Oscar material, but it was entertaining. We enjoyed it and I would recommend it. Have you seen Unstoppable? Have you ever felt like your life was a “train wreck?” Or what is a movie that had a surprising impact on you? Yes, we plan to see Unstoppable. The movie that stunned us soon after I began chemo first time around, was the movie, “Up”. We had no idea that this fun little animated movie began with Ellie dying and leaving Carl a widower. We gulped, tears streamed down our face, and we determinedly watched the rest of the movie, enjoying it immensely. But those first few minutes…a weeper, for certain. WhiteStone, Thanks for your comments. I agree with you about “Up.” I, too, was surprised by the emotional beginning of it and I understand how it made you cry! I enjoyed it more than I thought I would. My husband and I had the exact same experience watching Up last year. We sat in the movie theatre, holding hands with tears streaming down our faces. We still can’t re-watch that movie because of the emotion it conjures up. And speaking of your statement about why is it always the wife who dies. Think about fairy tales, for the most part none of the characters have mothers but widowed fathers. Hunh. Tina, You are so right about “Up” being unexpectedly emotional. You know I never thought about the fairy tale angle. You’re right many of those characters are motherless. Good observation! Hi Nancy I particularly like Denzel Washington so will look out for the movie when it comes on DVD. WhiteStone, I will also check out Up. Nancy, my boyfriend and I are also movie buffs! We go ALL the time. On Tuesday nights you get in for half price here, so it’s our night to go (and I wonder if no one else has gotten the memo because we almost always have the entire theater to ourselves!). We haven’t seen Unstoppable because we figured we pretty much saw the entire thing in the preview alone– it gave so much away! I hate when that happens. Shortly after my mom died, I went to see ‘PS I Love You’ with my friends and their moms. BIG mistake. The lead character loses her husband to cancer (the one movie in America where the woman doesn’t die I think), and still, I lost it right in the theater. I think the part that got to me most was when she kept replaying her husbands voice mail because my brother did something similar. I had found my mom’s cell phone and was looking for a number in it. When I went passed my brother’s name in the call log, I heard something. I clicked again and put my ear up to the phone. It was my mom saying his name (she had a voice dial program set up). I gave it to my brother and he replayed her voice over and over and cried. It was terrible. Hi Sami, What a touching story you share here about hearing your mother’s voice, how bittersweet. Luckily you had your friends with you at the movie you saw shortly after her death. I’ll be thinking of you through the holiday season that is filled with many memories I’m sure. 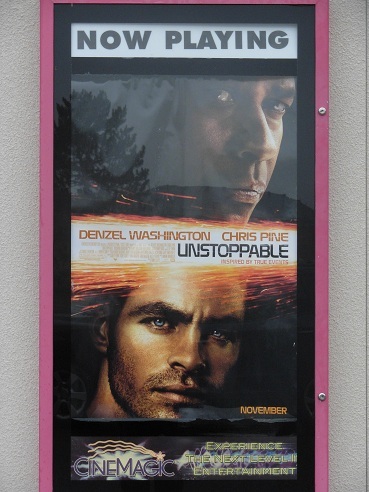 I want to see Unstoppable, but mostly for Chris Pine! I loved him in Star Trek. My husband doesn’t like going to the movies, though, so I may need to find someone else to go with me! I loved “Return to Me.” The main character, played by Minnie Driver, was single and had a large scar on her chest from heart surgery. 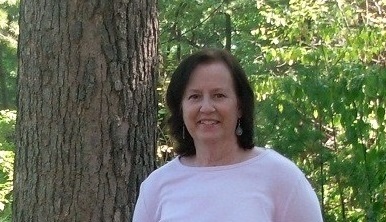 I related to her because I was single and had a huge scar on my chest from my mastectomy. I never could have imagined finding someone to love me…but it happened!